KATHMANDU, Feb 18: Minister for Forest and Soil Conservation, Shankar Bhandari is for lifting the ban on the extraction of aggregates from the fragile Chure region. In a meeting with President Bidya Devi Bhandari on Friday, Minister Bhandari lobbied for the same. President Bhandari had invited Minister Bhandari to her office for consultations aimed at reviewing the progress on Chure conservation and exploring the way forward. “We export our manpower to Qatar and Saudi Arabia to earn money. Why can't we do the same with our stones, pebbles and sand? After all, we have these resources in abundance and exporting them could be a huge source of income for us. If we obstruct such viable options, how can our country be developed?” a particpant of the meeting quoted Minister Bhandari as asking the President. President Bhandari had called Minister Bhandari for discussions following media reports that the government was preparing to lift the ban on extracting stones, boulders and sand from the Chure region despite criticism from all quarters. Heads of the President Chure-Tarai Madhesh Conservation Development Board, Nepal Forum of Environmental Journalists, among other organizations, were present in the meeting. In the meeting, Minister Bhandari argued that exporting Chure resources is essential for the development of the country though conservationists have warned that extreme environmental degradation will take place if the existing ban is lifted. Backed by Minister Bhandari, a proposal on lifting the ban on Chure extraction was sent to the cabinet about a month ago, inviting a string of criticism from various quarters. 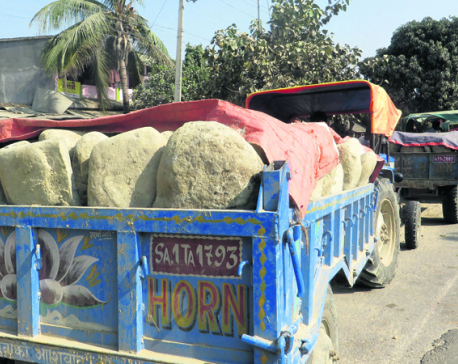 According to Rameshore Khanal, former Chairman of the President Chure-Tarai Madhesh Conservation Development Board, extraction of sand and stones from the highly vulnerable Chure hills endangers the region's already threatened environment. The property details of Minster Bhandari show that he has stakes in a crusher and stone excavation company. It is believed that the minister is pushing for lifting the ban on Chure extractions for the benefit of his company. The forest minister also vented his ire against the media for 'tarnishing his image' by putting him in a wrong light vis-a-vis his proposal. Although excavation of resources from the Chure region has been prohibited since 2014, extraction is still ongoing unabated in the region, according to Republica's district reporters. Extraction of sand, boulders, and stones is a common sight. However, the authorities concerned and police deployed to prevent such excavations are keeping mum on the issue despite repeated complaints. Such silence from the authorities has been deemed fishy and highly suspicious. The Chure range is extended from the Indus River of Pakistan in the West and Bharamaputra of India in the East. 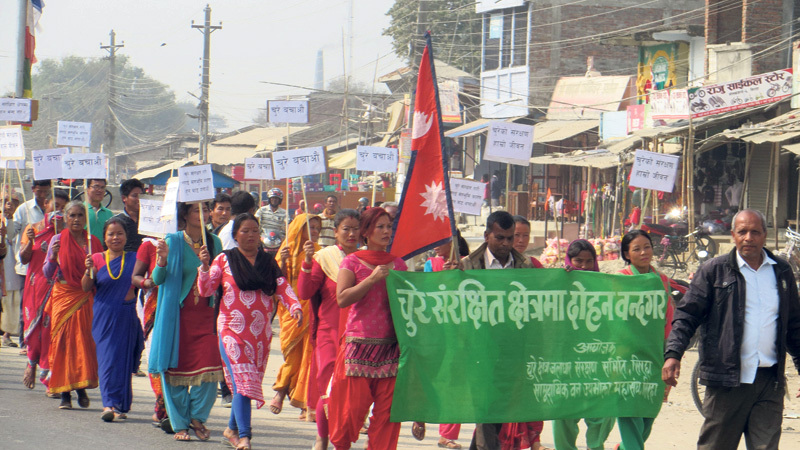 About 13 percent of the total area of Nepal is covered by the Chure region which spread to over 36 districts.